In his talk, “Addicted to Emotion: How Affective Neuroscience Sheds Light on the Brain Sources of Consciousness and Our Love of the Arts,” Jaak Panksepp argues that the affective neuroscience understanding of human and other animal brain organization has provided evidence for a diverse set of inborn emotional systems, homologous across mammalian species that have been studied, albeit with interesting variations across individuals and across species (a basis for personality?). They constitute part of our shared evolutionary heritage, and provide a basic experiential (affective) foundation for the rest of the mind. These systems, arising from ancient regions of the brain, may constitute the basis of consciousness itself. These affectively valenced action/feelings systems provide survival codes for living, and control much of our learning and cognitive decision-making: Our primal fears teach us to seek safety. Our playful joy cements friendships through the power of affectively positive companionships. Sexual arousal motivates us to reproduce, and in females this psychic energy, affectively transformed into nurturance, establishes moods for caring for others, especially infants, facilitating establishment of social bonds. All good literature, movies, music ride upon the diverse manifestations of the primal emotional powers of the mind: What could be more compelling? More endlessly fascinating? Our work on three of these systems (SEEKING, PANIC and PLAY) has led to three novel anti-depressants for humans. These powers of the mind also permeate our minds and our arts. They may be the solid foundation for existence upon which our cognitive consciousness was built. Kay Young’s contribution to the symposium is “We Are Our Attachments: Panksepp, Phenomenology, Play and Shakespeare’s Second Acts.” “Rat laughter.” Who but Jaak Panksepp would think to tickle rats and record the sounds they make in response at a decibel we can hear to help us imagine that some other animal might laugh? “ ‘If this be magic, let it be an art lawful as eating.’” And who but Shakespeare would bring back “from the dead” Hermione, wife of King Leontes of The Winter’s Tale to help us imagine a second chance at life and at love and to show us such magic is as real as eating? 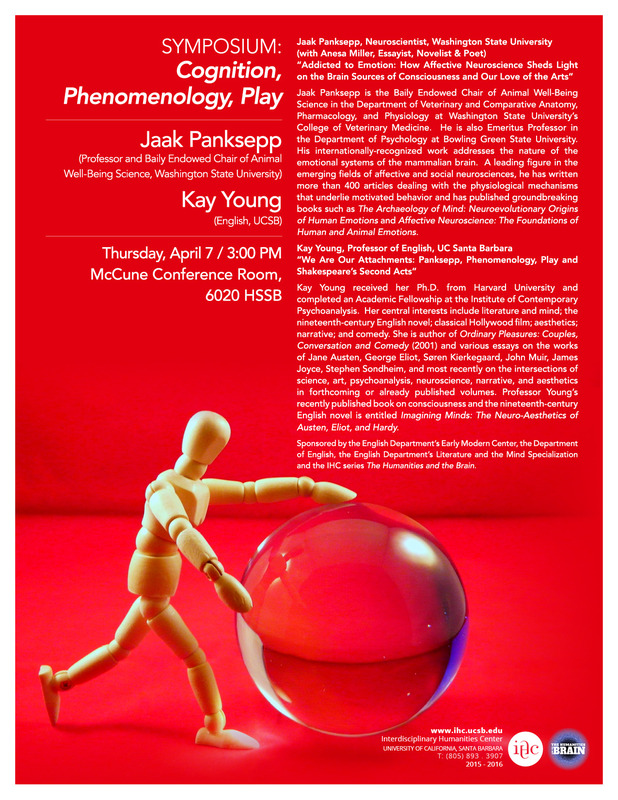 In this talk, Kay Young brings Panksepp’s neuroaffective research on the primary process of play and philosopher Dan Zahavi’s work on intersubjective phenomenology to Shakespeare’s genre of Romance to consider how adult play, loss and time bring us to know—we are our attachments. Kay Young’s central interests include literature and mind; the nineteenth-century English novel; classical Hollywood film; aesthetics; narrative; and comedy. She is author of Ordinary Pleasures: Couples, Conversation and Comedy and Imagining Minds: The Neuro-Aesthetics of Austen, Eliot, and Hardy. Sponsored by the English Department’s Early Modern Center, the Department of English, the English Department’s Literature and the Mind Specialization and the IHC series The Humanities and the Brain.